Despite rumblings of discontent over a "flood" of cheap imports from Asia, the East African country is currently short of options. After months of policy ping-pong on whether Kenya should let in fish from China, it looks resigned to the imports from the Asian giant meeting local demand. A recent budget forecast shows the country will continue to import China's fish for at least three years. The 2019 budget policy statement, the basis of the national budget, pegs local fish production at 180,000 tonnes a year. That's against Kenya's "requirement of 500,000 tonnes". But "the government is working towards producing more fish", the national treasury said in the February 2019 document. Kenyan traders have protested the "throwaway prices" of Chinese fish. In October 2018 President Uhuru Kenyatta hinted at a ban, saying Kenya needed to find "out of the box" ways to limit the imports. China's ambassador reportedly described the ban as a "trade war" and threatened sanctions. He later softened his tone. "We hope that the issue of fish imports will be resolved in an amicable way," Zhang Gang, a spokesperson for China's embassy in Kenya, told Africa Check as the controversy raged. "As a strategic partner of Kenya, China will not [engage] in a trade war." But Kenya's department of fisheries took Kenyatta's cue and said it would not approve applications to import tilapia, the fish most imported from China, from 1 January 2019. Weeks later the department reversed the decision "to allow further consultations". 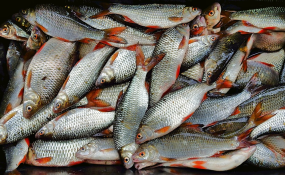 The move to curb imports also came amid reports claiming Chinese fish imports contained poisonous heavy metals. In its budget statement Kenya's treasury said it was "not true that fish from China has mercury". But what are the facts on Kenya's fish? This factsheet looks at the key issues. From 2008 to 2018, Kenya's highest production was 182,626 tonnes in 2014, the most recent official data shows. This fell to 135,197 tonnes in 2017. The country aims to raise its yearly output to 231,359 tonnes, the treasury said. It would do this by curbing illegal fishing in Kenya's waters and investing in a fishing fleet for the country. Kenya can produce 14 million tonnes of fish a year with a value of KSh50 billion, a 2013 report from the Food and Agriculture Organization (FAO) estimated. This is if it uses all 1.4 million hectares identified as suitable for fish farming. Where does Kenya's fish come from? Kenya gets its fish from both sea and inland sources. In 2016, inland sources made up 73% of total production, marine sources 17% and 10% was from fish farms. Data shows Lake Victoria was the biggest inland source in 2014, 2015 and 2016. In 2016 the lake produced 90.7% of the local harvest, a rise from 81.9% in 2012. In its Fish to 2030 report, the FAO says Kenya is one of the major countries influencing global prices for freshwater fish. But Taiwan, Honduras and the US control 99% of the market for tilapia, the fish Kenya imports the most, according to local fisheries data. Tilapia and frozen mackerel made up 85% of Kenya's 2016 fish imports, with 68% coming from China. In 2017 China remained Kenya's top source of fish imports, according to the national statistics office. Other fish product imports included tuna, Nile perch, sardines, fish feed and fish waste. Kenya also imports fish from Japan, South Korea, Uganda, Tanzania, Vietnam, Mauritius, Germany, Norway and South Africa. Kenya exports fish and seafood to the EU, US, China and Japan. These include Nile perch, frozen octopus, lobsters, cuttlefish and prawns. What is the local demand? Kenya consumed 188,000 tonnes of fish in 2017, according to the 2018 economic survey. This included 144,000 tonnes of freshwater fish, 23 tonnes of marine fish and 21 tonnes of pelagic fish, all locally produced. Another 51,000 tonnes were imported, leaving 1,803 tonnes unaccounted for. This could be due to either the rounding of figures or data gaps at production sites, Susan Imende, the acting director general of Kenya Fisheries Service, told Africa Check. The numbers on fish from regional East African Community trade could also have been poorly captured, Imende said. "However, this has been addressed by strengthening border control by posting fish inspectors and training the other agencies working at ports of entry." How much fish do Kenyans eat? The average amount of fish eaten by each person in Kenya dropped from a yearly 6 kilograms in 2000 to under 5 kilograms in 2014, according to a 2015 FAO estimate. The world consumed an average of 20.5 kilograms of fish per person in 2017, says the FAO's 2018 State of Fisheries and Aquaculture report. Asia's consumption was highest at 24 kilograms per person, and the Latin America and Caribbean region's the lowest, with 9.8 kilograms of fish consumed per person. Africa's yearly fish consumption was 9.9 kilograms for each person. This ranged from about 14 kilograms in West Africa to 5 kilograms in East Africa. By country, Senegal led at 20.7 kilograms per person. Sudan ate the least fish: just 2 kilograms per person in 2017, according to the FAO. Could Kenyans eat even more fish? Kenya's future demand for fish is tied to population growth and efforts to meet consumption targets, the Fisheries Service's Imende told Africa Check. The country aims to reach the East Africa Community average of 7 kilograms per person a year and then on to the annual Africa average of roughly 10 kilograms, she said. But projecting actual demand was a"difficult question" that depended on supply and purchasing power, said Dr Richard Abila, a senior fisheries and aquaculture specialist for the International Fund for Agricultural Development. So far there were no "reliable studies or projections to give us the right figures", Abila told Africa Check. He directed us to an international model to help with this. Most estimates considered factors such current prices, the relative price of substitutes, incomes, potential demand and consumer preferences, Abila said. "It is generally assumed that fish demand at a global level is mainly driven by increasing incomes and population growth," Abila said. But in Kenya other factors were at play, he said. These include increased awareness of the health benefits of fish and changes in consumer preferences, especially in areas where fish isn't usually eaten. Kenya's demand for fish could even decline, Kevin Obiero told us. A doctoral student the Institute of Hydrobiology and Aquatic Ecosystem Management (IHG) of the University of Natural Resources and Life Sciences in Vienna, Obiero referred Africa Check to March 2019 research. This predicts a decline in Africa's annual fish consumption per person from 10 kilograms in 2015 to 8.5 kilograms in 2030 and 7.7 kilograms in 2050. Either way, China will continue to loom large in Kenya's fish market until local production improves. © Copyright Africa Check 2019. Read our republishing guidelines. You may reproduce this piece or content from it for the purpose of reporting and/or discussing news and current events. This is subject to: Crediting Africa Check in the byline, keeping all hyperlinks to the sources used and adding this sentence at the end of your publication: "This report was written by Africa Check, a non-partisan fact-checking organisation. View the original piece on their website", with a link back to this page.